The back of the book has liner notes about the story behind each story, as well as some songs associated with each. "Here Comes the Sun Again"
"For the Widows in Paradise, for the Fatherless in Ypsilanti"
"Loss, temporary and permanent, physical and emotional, is the hard, gleaming thread tying together Laken's short-story collection... An absorbing literary exploration of the geography of loss." "Laken demonstrates that all of us are in some way isolated from others, trapped in our own thoughts, our own hurts, our own bodies. In setting her stories alternately in Russia and the United States, Laken shows that borders and oceans create less of a gulf than does the tiny space between two people. Bridging that chasm is our greatest challenge." "Fine craftsmanship and powerful insight." "A taut, beautiful book about very human characters struggling to find connection and to make sense of the lives that they’ve almost unexpectedly found themselves living." "Vivid and evocative, these stories will appeal to readers of both popular and literary fiction." "A work of daunting versatility and technical skill, the product of a writer absolutely at home in the language and working vigorously within both new and old forms... This is a writer of wonderful gifts." "Valerie Laken proves herself again to be a writer of vast compassion, and dead-on accuracy, in these stories. Separate Kingdoms is a travel through the human psyche, but it is so rawly full of vivid places and pitch-perfect dialogue and sensory detail that you know you are in the visceral world of the characters as well as their minds. There are only eight stories here, but each one is so rich, so textured and nuanced, that I felt I'd dwelled among these familiar strangers in their kingdoms for a sumptuous period of years, and yet I started the collection again as soon as I had finished it, recalling things I felt an urgent need to read again. Valerie Laken takes aim at the human experience, and does not shoot. Instead, she steps forward, into places we wouldn't dare, and lays them bare for the reader. This is life-changing work, the kind of reading one longs for and so rarely finds." “Beyond the luminous prose, the shining intelligence (as opposed to mere cleverness) and narrative boldness, what I perhaps prize most in Valerie Laken's work is an empathy that knows no boundaries. She conjures her disparate figures and settings with a clear-eyed authenticity that goes beyond mere detail, arrowing in on the emotional truth of a character or situation." "Valerie Laken writes about the emotionally and physically maimed with a startling poignancy. Blind Russians, handicapped golfers, college exchange students, seizure victims: Laken can do it all. 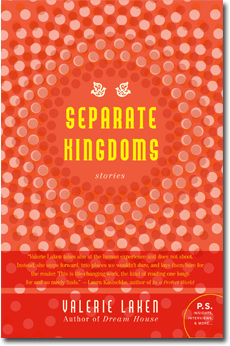 Separate Kingdoms is, quite simply, a wonderful collection."